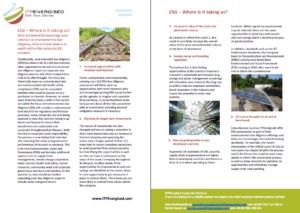 ESG- Where is it taking us? ESG – Where is it taking us? With the term ESG becoming more common in environmental due diligence, what is it and what is its worth within the corporate DD process? Traditionally, environmental due diligence (EDD) has been a bit of a tick-box exercise, often appended to the end of a structural due diligence report or corporate due diligence process and often completed as a bit of an afterthought. The focus has historically been on contaminated land and environmental and health safety (EHS) compliance and its associated liabilities that could be passed on to a purchaser or investor. However, in recent years there has been a shift in the market and while the focus of EDD still considers contaminated land and EHS for regulatory and financial purposes, many companies are now being exposed to new risks and are having to go above and beyond to ensure their investments are sustainable and successful throughout their lifespan. With the rise in corporate social responsibility the process is now taking that next step into assessing the social and governance performance of an asset or company. This is termed Environmental, Social and Governance (ESG) and includes additional aspects such as supply chain management, climate change adaptation, water scarcity, health and safety, human resources, community work and corporate governance structure and function. So the question is, why should you bother expanding your due diligence scope to include social and governance? Firstly, and probably most importantly, carrying out a full ESG due diligence assessment will likely open up opportunities with more financers who are increasingly putting ESG issues further up the agenda. In tougher and uncertain financial times, it can be beneficial to be transparent about all the risks associated with an investment, including planned mitigation measures if necessary. The nature of investments has also changed and we are seeing a reduction in short-term investments and an increase in investors keeping and operating the assets over a longer period of time. It is important to ensure compliant operations to avoid potential fines and prosecution but identifying the opportunities as well as risks can have a real impact on the value of the asset / company throughout its lifecycle. In other words, if the opportunities for improvements and cost savings are identified at the outset, there is more opportunity to put measures in place to achieve them. This means you are more likely to embed these values within the company. As a knock on effect from point 2, this could in turn likely increase the overall value of the stock and yield better returns at the time of divestment. The bottom line is that finding opportunities at the outset to improve a company’s sustainable performance (e.g. energy and water management screening) will ultimately save money in the long-run, as well as improve employee satisfaction, boost reputation in the industry and create the potential to enter new markets. In general, UK standards of EHS, security, supply chain and governance are higher than in developing countries and there is a duty of care when operating in these locations. While regulatory requirements may be reduced, there are the same opportunities to yield improved results and cost savings and it is beneficial to pass on good practices.In addition, standards such as the IFC Performance Standards, the European Bank for Reconstruction and Development (EBRD) and the new World Bank Environmental and Social Framework (ESF) coming in 2018 often need to be met or taken into consideration. Consultancies (such as ITPEnergised) offer ESG assessments as part of their environmental due diligence offerings and there are increasingly more benchmarking standards. For example, the recent introduction of the GRESB score for ESG in real assets has helped simplify the process and in the future this could be used more widely to inform the investment process, as well as allow investors to capitalise on opportunities and effectively manage supply chain and spending.